Nicklebutt Automation - Laser Lay-Out Marking System for Structural Steel — JPS International Inc. This machine will undoubtedly change the Structural Steel Fabrication Industry forever. Manual Layout is now a thing of the past. 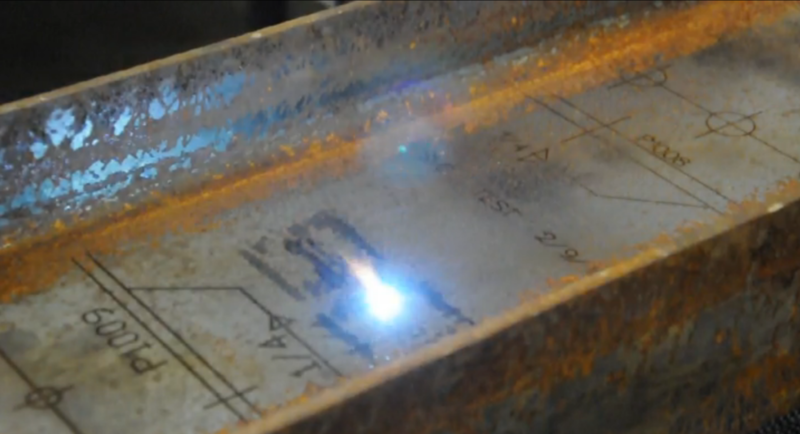 The Information for layout marks, welding information as well as other data will be directly imported from the 3D drawing to the Nicklebutt LLP5020 and transferred on to the beam via two (2) Fiber Optic Lasers. The Nickelbutt LLP5020 is a self-contained unit (with RFM measuring unit) capable of marking structural members up to 50” wide and 20” high. Absolutely NO mistakes, if the drawing is correct the lay-out on the beam will be correct. Complete lay-out with all Welding Information as well as orientation marks. A 50 men shop that works 2500 man-hours per week can expect savings of approx. $10,369.00 per week. A 100 men shop that works 5000 man-hours per week can expect savings of approx. $20,738.00 per week. A 140 men shop that works 7000 man-hours per week can expect savings of approx. $29,033.00 per week. The Nicklebutt model LLP5020 is a completely independent stand alone system that can be integrated into any existing system and shop. Reduced Material Handling, therefore faster and more productive then any other machine currently available on the worldwide market. Takes all Information directly from 3D modeling Software such as TEKLA, Design Data, Strucad etc. Extremely fast, marks 380 characters per minute and up to 400 Inches per minute. ELower operating cost than any plasma marking machine! Don't be fooled when considering plasma lay-out marking. Get all the facts and take the energy cost, consumable cost and labor cost into consideration. The results will amaze you. Contact us today for more info!